Happy Friday! 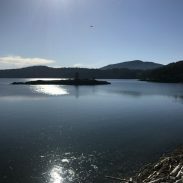 Each Friday, I share some of my favorite things from the past week; this week features interesting reads and a special giveaway at the bottom of the post! Steve Magness, the author of the Science of Running blog, asks the question that every running coach wonders: Is Coaching an Art or a Science? His discussion is interesting, especially if you are a running coach. Magness’ conclusion echoes what I’ve discovered in my tenure of as a running coach: it’s not a dichotomy, but an intertwining. Coaching is simultaneously an art and a science, especially when you realize that not all runners fit the tidy formulas found in even the best running books. 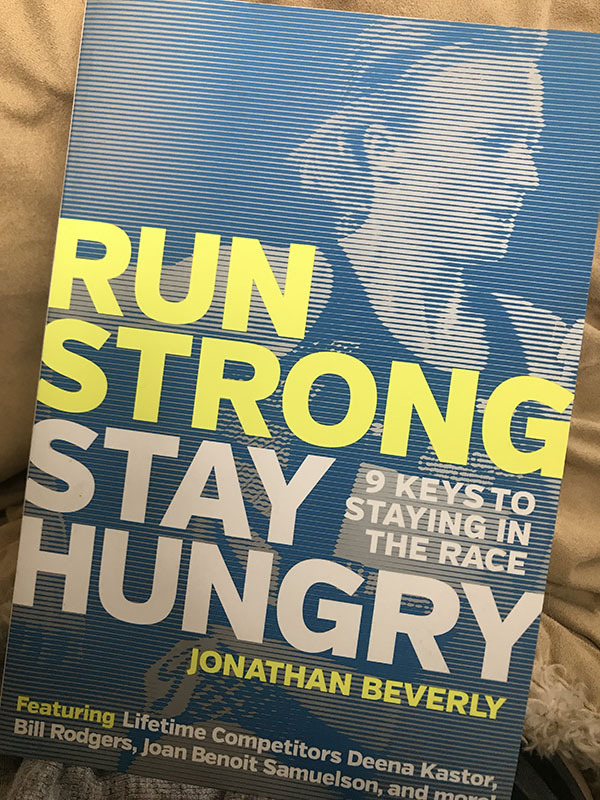 I’m currently reading Run Strong, Stay Hungry by Jonathan Beverly and thoroughly enjoying his examination of what makes a lifelong runner. 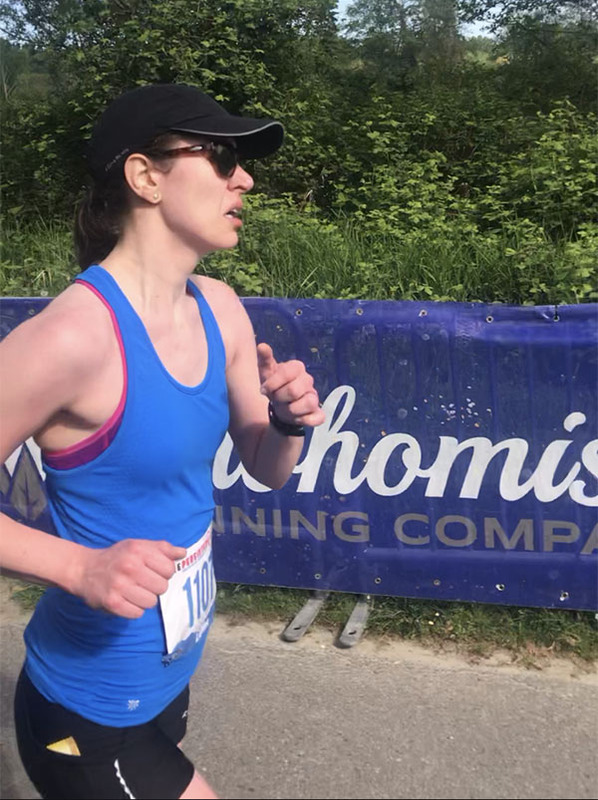 Beverly shares an excerpt for the book in this article for Women’s Running, “How to Set a PR in Every Decade.” Beverly discusses how doing a reboot of old habits and old expectations as you age as a runner is key to preventing burnout. And quite honestly, I think that reboot can be valuable no matter what age you are – your goals and needs can change over the years, and burdening yourself with past habits can in some situations derail you from progressing to your current potential. I always enjoy Runner’s World “Eat Like an Elite” articles and their recent coverage of second place Boston Marathon runner Sarah Sellers is fascinating. Why? Because Sarah Sellers, who works a full-time job while training, eats a surprisingly sane and balanced diet. She talks about discretionary calories – including her daily dessert – and how she takes care of bone density via nutritional choices. Ask me about heart rate training and I’ll launch into a long monologue about all the considerations, benefits, and detriments. Some runners swear up and down by low heart rate training while others (such as myself) haven’t even ever strapped on a heart rate monitor. Regardless of your stance on heart rate training, one area where technology and research are currently booming is heart rate variability (HRV) – how your resting heart rate changes day to day based on your body’s response to training. In the article “How Heart Rate Variability Tells You When to Hammer,” Alex Hutchinson of Sweat Science breaks down all the various research about how HRV can benefit athletes and considers if the technology is really valuable at all, or if it falls into the realm of overthinking. My favorite sentence from this article comes in the final paragraph, when Boston Marathon winner and former Runner’s World editor Amby Burfoot shares what he believes is the greatest technological advancement in running. Forget heart rate monitors – we’re all grateful for wicking socks that keep our feet blissfully blister-free. I’m grateful to the kind folks over at StrideBox for sending me a box of goodies each month! 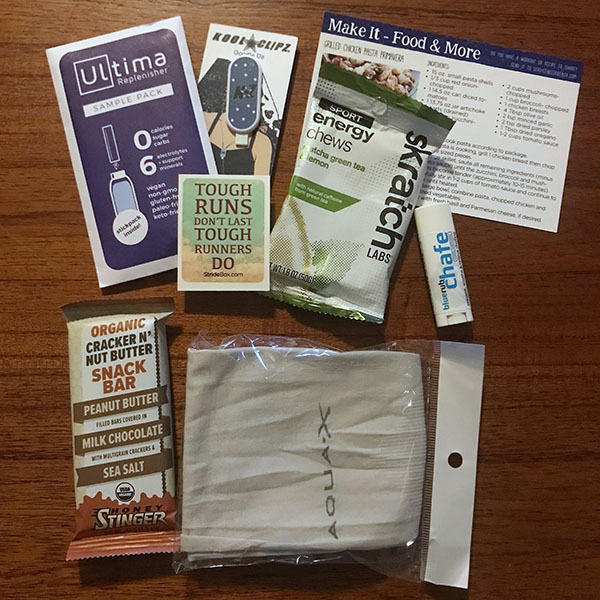 This month’s box featured a Honey Stinger snack bar (which was consumed while writing this post), Skratch Labs Energy Chews, Ultima Electrolytes, arm warmers, a headphone clip, and a small anti-chafe balm that’s perfectly sized for tucking into the pocket of your running shorts. Use the code LAURA5OFF to receive your first StrideBox for $10 off (code valid through May 31, 2018). I am also partnering with StrideBox to giveaway one StrideBox to one winner (valued at $19.95). You can enter this giveaway by filling out the Rafflecopter below! Do you change your training routine often or stick to the same habits? Would you consider coaching an art or science? To enter the StrideBox giveaway: what piece of running gear is your current favorite? I agree that coaching is an art and a science! Part of it really needs to be individualized for each person, while using information about strategies that have been proven to work and adjusting as needed. That info about heart rate is interesting! I’ve never trained using a HRM but once it awhile I will pay attention to my heart rate on easy runs to make sure I am truly keeping them easy. I also love my HR monitor for training and specifically for fatigue. I used to loathe wearing it all the time but tracking my efficiency and fatigue over years has really helped me train smarter – knowing when to back off and when to hammer it. My current favorite piece of running gear is my Garmin. I just started running again about 3 weeks ago after having labral repair surgery in my hip in November so my Garmin was been essential to keep track of my run/walk intervals as I ease back into running. I like be the articles you share every Friday! My current favorite running gear is my Tracksmith Session Shorts! My Garmin is my fav piece of running gear. I hate how attached I am to it, but the thought of running without it, well, I can’t even think like that, lol! My runkeeper app is my fav running “gear” right now. My Garmin is my favorite! My newest favorite running accessory is my Koala Clip for my phone. I feel safer running with my phone on me, even though I’m not using it when I run… the Koala Clip holds my phone securely in place with no bounce or chafing. I wore it during the Eugene Marathon a couple weeks ago and pretty much forgot it was there– and having it on me allowed my sig other to track where I was! My older favorite accessory is my Garmin 235. Great watch. I wear it even when I’m not running! I’ve never used a heart rate monitor either! and agreed on the sweat wicking socks! at this point I can’t even imagine not having great socks and getting blisters. that would be awful. From the titles, your linked articles sound extremely insightful! And, what did you think of the Honey Stinger bar????? My favorite piece of gear right now is a compression short from Old Navy, mainly because it has pockets big enough for my phone! My favorite running gear right now is an Altra short-sleeved short – I think it might be the first one I’ve actually bought, since I have so many tech tees from races! But this one is super lightweight and the upper half of the back is mesh; it’s the first sleeved shirt I’ve felt like I might be able to wear in the heat of summer. My favorite piece of running gear are my Brooks shorts. I don’t even know what type they are but they are fabulous. They are similar to their Chaser 5″ shorts but better. I got a pair of them for my birthday and loved them so much I bought 2 more. They are a little longer (which I like) and are super comfortable. Now that summer is almost here my favorite running gear is my baseball cap. Got to keep that sun out of my eyes and off my face! I have always wanted to try Stridebox! My current favorite piece of running gear is my Nike Epic Lux Running Tank. I just found your blog from pinterest and love it! I am currently training for my second marathon. I think my favorite piece of running gear at the moment would be my wireless headphones. 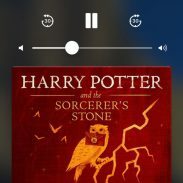 Nothing like listening to a podcast cord-free to get me through those long runs! I don’t really run anymore (thanks injuries) but hope to someday, again. My favorite running gear is definitely my VivoActive watch. It’s a stylish watch and I can wear it all the time, even when I’m not running, because it doesn’t look like a traditional Garmin watch. Right now, I’m loving my Oiselle Spandos shorts! I often stick to a work out habit, but try to switch up the individual sessions a bit. My favorite piece of running gear right now is my Milestone Pod. I find the insights so interesting! My current favorite piece of running gear is my fitbit – I just got one and I love it! It’s been great for tracking things. I have been trying to loose weight for the past month. Brisk walks and portion control cutting out all kinds of sugar. (which is really hard single mom) but I have lost 5 pounds. My favorite piece of running gear would be my running shoes.